[March 06, 2007] The recently formed Route 66 Heritage Foundation of Logan County has announced two events to raise funds for saving The Mill and for other Route 66 projects in the county. The first event is a "Spring Fling" scheduled for March 25 at Hallie's, on the downtown Lincoln square, from 11 a.m. to 2 p.m. Come and enjoy a Route 66 theme, '50s and '60s music, unusual decor from the original Mill restaurant, and great home-cooked meals. The meal selections will be fried chicken or roast beef, mashed potatoes, green beans, a roll, and a drink. For kids, there will be chicken strips, fries and a drink. Prices are $8.95 for adults and $5.95 for children, and donations will also be accepted. Hallie's is located at 111 S. Kickapoo St.
Funds raised will go toward the restoration of The Mill, a famous restaurant located on the 1930-1940 section of Route 66 in Lincoln. The Mill opened originally as a sandwich stand in 1929 and later became a frequented restaurant that was known for its unusual decorations (such as a mechanical leg sticking out of the ceiling) and for a pork tenderloin type of sandwich known as the "schnitzel." The structure, which is shaped like Dutch windmill, closed in the '90s, and now efforts are under way to restore the original building as a museum. The Route 66 Heritage Foundation of Logan County will also host a summer garage sale along Route 66 in Logan County on June 9 and 10, from 8 a.m. to 4 p.m. each day. The group is looking for participants in this event, so if you'd like to set up your sale along Route 66, please make sure to contact them. The sale will be held throughout Logan County, including Atlanta, Lawndale, Lincoln, Broadwell and Elkhart. There is no fee to set up garage sales along Route 66; however, a $10 donation is required for listing on the map, which will be distributed to visitors. Vendors and off-site sales and businesses are also encouraged to participate for a small fee, and they will be setting up at designated sites in the county. All donations will benefit projects designed to endorse Route 66 history and restoration in Logan County. The garage sale has been a key project of foundation member Bruce Huskins. 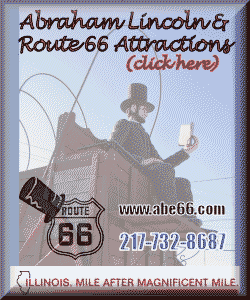 For more information on either of these events, please contact the Route 66 Heritage Foundation of Logan County at 217-732-8687 or info@abe66.com. You may also visit their website at www.savethemill.org.